There is no explanation for this piece, and no artist has claimed responsibility, so I wonder if this is a spontaneous piece of street art by a street art fan- or is this the beginning of someone’s street art career? The artwork itself is very simple- a cut out printed baby head pasted on a City of Chicago Rat Warning. Combined with the words “If Rats Can’t Feed, Rats can’t breed”, the City of Chicago warning takes on a different meaning. This stencil has a Ray Noland feel, but isn’t quite right. The white used in this cheerleader appears different, but the stencil is somewhat political. I wasn’t aware of Ray Noland criticizing religion (or the “American way”) so I speculate this artist went to Ray Noland’s stencil making class. Flickr user Mark 2400 has captioned his shot of this religious cheerleader “Go Team!”… go Team America? Or maybe this is a new side of Mr. Noland? Nautilus is a recent addition to the street art scene (about a year), and you may know Nautilus’ work by her balloons or poetry (I say “her” because something about Nautilus’ work is delicate and “feminine”-). Nautilus is MK Meador’s (of Chicago Art Collector) favorite street artist, so it was only a matter of time before Chicago Art Magazine mentioned Nautilus. Interestingly, the name “nautilus” was given to this artist by the flickr community- as this artist has a name that “can’t be said or written” . The work featured above has been up longer than the month of July, but it appears to be the last Nautilus piece for quite some time… perhaps she is away on vacation? Saro has been posting boards on Chicago’s streets for a couple of years now, but I am really digging the recent use of bright neon (reflective?) paint and polka dots. Saro’s cyclops reveal an interest in anatomy- a favorite Saro of mine features a skeleton on a bird. No discussion of board artists can be had without including Artillery who also tacks up wooden boards as a form of street art- a practice Artillery has been utilizing since at least 2003. Klepto is another board artist who incorporates poetry into his/her work, and if Klepto was still using the streets of Chicago to display his/her work , they would easily make the top of this list. “In our attempts to dismantle the publics view of Graffiti Writers as being violent and destructive, we are producing this battle to show the positivity and creativity which resides in the true meaning of Hip Hop”. Flickr user EMENFUCKOS has a set of the graffiti battle here, and flickr user Billy Danze posted great shots of the battle in his photostream. The winning work in the Logan Square battle is viewable here, but I have to agree with the flickr community in saying this one should have won. Two Equals: one with a guest appearance by air, the other incorporating the mathematical equality sign. I am a fan of Equal simply based off the name; “equal” as a tag carries numerous implications. It is a loaded word, and just by spraying “equal”, one is portraying a message- whatever message the viewer wishes to see. This colorful and fluid work by CYFN reminds one of a psychedelic cartoon. Also, there is this pair by NEPHE and NSPYR. The broken concrete, with the underlying brick pattern is striking to say the least. SHIP and SWS’s recent creation earns a nod from me due to its pixelated nature. There are many shots of this mural floating around the web. This mural features three astronauts, with one holding a test tube and the other waving. The astronaut chosen for the display above reminded me of Threadless’ “Funkalicious” Tee by Christopher Golebioski. I hesitated to include a mural on this list, but Ray Noland’s recent rise to fame, coinciding with Banksy visiting our city (is Chicago elevating Noland because we want a good political stencil artist of our own?) proved I would be errant in not including his recent mural. Another mural worth checking out is Paulita’s Mural, by the THC crew. The first time I saw a “Don’t Fret” paste up, I mistook it for a Goons. I know, terrible of me- I thought the finer lines were a result of Goons finally taking an art class. To make further excuses, the one I saw had big lips, … and I was hung-over, rushing, and needing coffee. Don’t Fret has taken to incorporating fabrics in his work and his/her pieces enjoy a certain longevity. Other notable recent Don’t Fret pieces include a man in funky glasses viewable here and a gentleman in a sherbet suit here. Flickr user TEFennell4’s collection of Don’t Fret’s is worth perusing through. I know the above work has been up for a while, but Tiptoe deserves some Chicago Art Magazine loving. Notice the flying sprite-like figure in the upper left hand corner, which is a form by Nautilus. Nautilus and Tiptoe seem to be enjoying some type of benevolent street art relationship, as their works are seen together often. Tiptoe is known for his wolf parkas (like this piece), but the heart in the hands motif has become a common a subject matter for tiptoe. Tiptoe is in New York City at the moment. Choosing a July CLS wooden sculpture to feature was difficult considering every work by CLS is worth mentioning. This piece with branches by CLS is also worth noting, as is this blue wooden piece, and this red installation. CLS has been around for a bit (here is a spray from a couple years back), and his/her wooden sculpture installations are insanely unique in the world of street art. 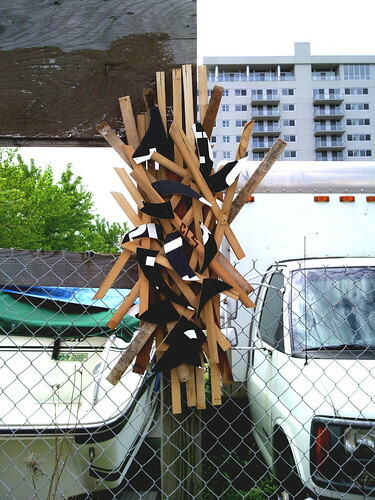 The only other Chicago street artist I would compare CLS to would be Merrick Brown’s hanging garbage sculptures, and that is a stretch. 1. The recent Futurama graffiti found in Wicker Park. Thanks for the find, Reddit!